A Guru is like the convex mirror in a torch. The bulb is the Jiva. The batteries are the life giving spirit of the Absolute. Without the mirror the light from the bulb is nebulous and directionless. With the help of the focusing mirror the light gets direction and strength and its focus is infinity, i.e., Godhead. The Guru's role is of the mirror in a torch. The nature of the world is repetive. The objects of the world do not hold the attention of the individual solely because of its finite nature. Nothing in this world lasts, but the nature of God is always captivating. Each moment is new, its experience ever-lasting. God is "Nitya Nutan" Always New never subject to the decay of time. .
Life's purpose is a quest for truth. Its like a Jackfruit, which has sheaths. The external skin is prinkled and hard, open it and you have the sticky flesh which you separate by rubbing oil on your palms. The oil is the Guru's Grace with whose help the process of self investigation can be easily initiated. The delicious yellow coloured fruit is then retrieved, open the yellow cover of the edible portion and you encounter a seed covered with transparent skin, peal the skin and what remains is the seed. Cut the seed in half and its section will reveal an indivisible pulp through and through. Life's inward quest follows a similar pattern. We peal layer by layer of the five sheaths namely the "Panch Koshas" (Annamaya Kosha, Manomaya Kosha, Vigyanamaya Kosha, Pranamaya Kosha and Anandmaya Kosha). The sheathes are clothed in the qualities of the three gunas namely, Tamas, Rajas and Sattva in that order and we are left with the indivisible Atman through and through. 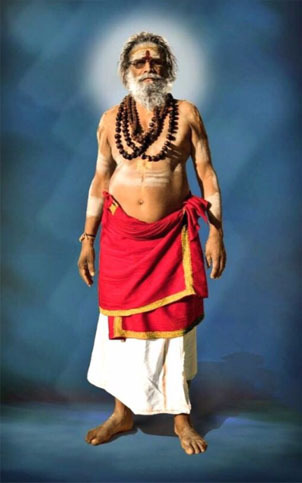 The final transparent skin of the seed is Jeevathma, the seed is the Paramathma the indivisible Brahaman. The "Eakam Sat" the only Truth. Knowing that Absolute which is indivisible and is contained in everything and contains everything, is the sole purpose of existence.